Looting, robbing, smuggling and plundering are the hobbies of every healthy pirate. 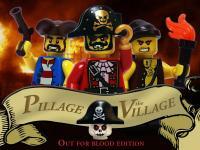 This contest explores the nefarious side of the LEGO System pirate's life, so your mission is to show us the gory aspect of their daily activities in the Golden Age of Piracy. If you have a soft stomach then you'd better not enter the pirate forum until the contest is over! Blood, gore, and insanity will prevail until then. It's time to announce the winners of the contest! Thanks everyone for participating, you all did great! With almost accepted 50 entries, the Large and Small Categories were a great success. If you are one of the winners, please PM me your full name and address (including country) and a phone number. Thank you Eurobricks Administrators and the The Lego Group for allowing such a great contest with great prizes. As you may have noticed, Kolonialbeamter won first prize for the Digital Category. Since he is staff, prizes will be distributed to the 2nd, 3rd, and 4th place winners. Large Division: Greater than 16x16. This includes most ship-based entries. There is no maximum size for Large entries. Small Division: Maximum size 16x16. This includes smaller vessel-based entries. Digital Division: Maximum size 16x16. 1. First rule: have fun! 2. The contest will run from August 14th to October 23rd, 2015. As long as it's still October 23rd somewhere in the world, you can still enter. 3. No entries will be accepted after that date, unless something arises causing the contest deadline to be extended unexpectedly. 4. This contest is open to all EB members, even if they joined EB after the contest has begun. Staff are allowed to enter, but are not eligible to win prizes. 5. One entry per member and per category. You can enter all categories with different entries, but you'll be eligible to receive only one prize. 6. All entries must be new creations, not posted anywhere else prior to being entered in the contest. You may be asked by a staff member to change your entry if it is too similar to an earlier creation. 7. All entries must be built from real LEGO. No clone brands. Third-party custom minifigure accessories are allowed. 8. Digital entries will ONLY be allowed in the Digital Division. 9. There is no piece restriction or height restriction or mini-figure limit for any class. 10. A reasonable amount of overlap is allowed in the Small and Digital Categories, but nothing extensive. Stacking plates/baseplates will not be allowed. If you are uncertain that your entry qualifies, we suggest posting it with a specific request in this topic for a review and someone in the staff will make a determination. Reasonable overlap is defined by:The main build should be able to fit inside the 16x16 square. Minor portions of the MOC such as greebling, minifigs, and accessories could be partially outside the "square". [*]11. Custom sails, rigging, and flags are allowed. [*]12. Non-Lego light sources are allowed as long as you mention it in your entry description. [*]13. You can use official stickers or custom stickers. [*]14. All entries must be posted as a new topic in the Pirate MOCs Forum, The thread title should be the title of the MOC. One creation per thread and one thread per creation. [*]15. A specific thread tag (beneath the title) is required for each entry. Only entries with these tags will be accepted. This topic contains the three tags below. If you select the relevant tag and your topic is not listed, you need your tag corrected. If you need help with your thread's tag, ask in this topic. [*]16. You may present up to 6 pictures per entry. Post pictures no larger than 800x600, but you may link to bigger pictures and image galleries. [*]17. You may do a 'full-blown photo edit' with all the text, effects, background compositing, support erasing, and other effects on one picture. This should be your first image. The first picture will become your thumbnail for the voting round, so pick well. All your other pictures may have no editing other than color adjustment or background removal for a solid-color background. For obvious reasons, any photo editing that changes the shape, functionality, or color (not tint or adjustment, but actual color) of a LEGO piece is prohibited. [*]18. All entries are considered WIPs (Works In Progress) until the deadline passes. You may change and improve your MOC right up to the deadline. [*]19. Your entry has to contain something evil, depicting the spirit of the contest. No peaceful scenes. [*]20. For each category, EB staff will make a first selection, and then EB members will vote for their favorite entry among that selection. If the staff doesn't question your sanity based upon your gruesome entry, it's not making the first cut. A summary of relevant questions asked about this contest with answers. Does the entry need a baseplate or custom plate? It doesn't matter what you place your heinous entry on. You may use baseplates, BURPS, plates, bricks, or prefab hulls. Does it mean only a 16x16 square? For a small or digital entry, the entry must be able to fit inside a 16X16 square. What pirate factions are allowed? [*]Are minifig scaled MOCs the only scale allowed? Scale does not matter, but it may be hard to see mayhem and heinous acts in micro scale. [*]Is the description I provide for my entry sound evil enough for the contest? It's hard to judge based upon a text description. Your description may sound inadequate for the contest, but then your entry turns out to be insanely awesome. Remember, entries are considered W.I.P.s until the end of the contest. If you're looking for ideas, I suggest the same as KB. Check out the Pillage the Village Contest from 2008,large, medium, and small entries. [*]Are early steam vessels allowed? Yes, early steam vessels will be allowed similar to the types found in the Ship Index. [*]May I mutilate and brutalize the actual Lego bricks in my creation by cutting, gluing, painting them? Custom Figs (including animals) are fine. Physical modification of Lego pieces for the construction of the entry is not allowed. Now, let's see your evil side! Get building, lads, there be pillagin' and plunderin' to be done here! Sounds great. I will probably enter. One question.. Is it large/small/digital ships on a baseplate/custom baseplate, normal pirate scenes, scenes with ships, or none of the above? 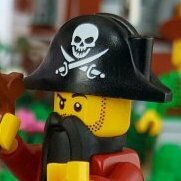 One question.. Is it large/small/digital ships on a baseplate/custom baseplate, normal pirate scenes, scenes with ships, or none of the above? It doesn't matter what you place your heinous entry on. You may use baseplates, BURPS, plates, bricks, or prefab hulls. If your entry's longest dimension (excluding height) is 16 studs or less, it will fall into the Small Division. If your entry is longer than 16 studs, it will fall into the Large Division. Edit: Aw come on...fast typing grammar gets me again.. I assume the 16x16 size limitation is really 256 studs in any configuration? I could build an irregular base, or does it mean only a 16x16 square? I get that this is about pirates carrying out violent acts, but does it mean they have to be attacking law-abiding people or could I show one pirate band attacking (slaughtering) a rival pirate village? Rule 19 refers to the "spirit of the contest" but the nature of the victims isn't mentioned. "Them that dies will be the lucky ones." - Long John Silver in "Treasure Island"
Yes, Islanders are allowed. Cannibalistic islanders eating pirates would fit right in with this contest. Were you able to flee fast enough? [D]oes it mean only a 16x16 square? The spirit of the contest is evil, gore, and insanity. You may have any combination of people performing heinous acts upon each other. I don't ruin my fingernails with real plastic. Hell yeah, diz gonna be some evil fun, muhaha. Thanks, Phredinator, for launching this! I find the contest idea awesome. And I would add a prize for the best comment. Are the builds only ship-based, or is an burning, sacked House (e.g.) also allowed? Can I build the undead pirates? I have a great idea for an entry... but in my mind it looks like a 32-32! Too big for the small category and too small to really compete in the large category! I'll have to down scale it to fit it into a category I can be competitive in. No limits on how "fantastical" this build can be, right? And the atrocities can be committed by anyone, right? Even the inperials? Oops! Sorry for asking a question you'd already answered. Anyway, it looks like there's lots of interest. 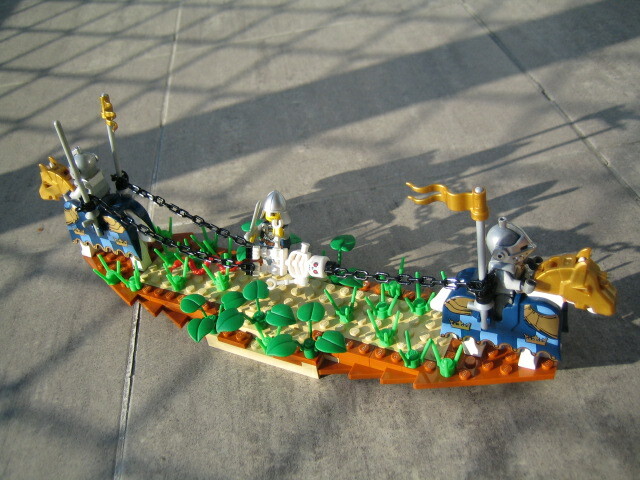 s it allowed only pirate century mocs or it is possible to make something from space pirates as example? Sorry, no space pirates, that was a few months ago. Golden age of sail themes that are typical in the Pirate Forum. If you see the description for the Pirate Forum, you should get a good idea what is included in the Pirate Forum. I would add a prize for the best comment. Maybe next year. We've done it in the past, but I wanted to keep the first contest I launch be relatively simple. Mayhem and acts of evil occur all over the place, not just in pirate ships. Burning houses and any other land, island, water locations are allowed. You may want to add some crying babies stuck in the burning house. Fantasy pirates similar to Pirates of the Caribbean are allowed. Skelie, zombie, and other undead scary pirates will be allowed. Oops! Sorry for asking a question you'd already answered. What about sea monster figures, a la Atlantis? Yes. I think of Atlantis figures similar enough to Davey Jones' crew. I am curious what you have in mind, just be sure it's evil. Master, concerning the digital division, so far I don't see any building limitations other than the general ones, like size and theme. That means all kinds of none existing part-color-combinations would be allowed, as well as floating bricks, and other digital particularities. Are there any additional limitations you would like to implement, like physical feasibility, structural integrity? Or is it voters' choice only? [C]oncerning the digital division, so far I don't see any building limitations other than the general ones, like size and theme. That means all kinds of none existing part-color-combinations would be allowed, as well as floating bricks, and other digital particularities. Are there any additional limitations you would like to implement, like physical feasibility, structural integrity? Or is it voters' choice only? No, there are no rules for the peculuarities of the Digital Divion. We'll see how it goes. If I made rules about floating bricks and using existing part-color-combinations, I (or you ) would have to enforce them. Digital MOCs have their own set of limitations compared to physical bricks, such as the lack of string. The Digital Division is not for physical bricks, so placing limits on the division to make it similar to physical entries does not make sense to me. Physical entries will have a variety of building skill in members with limitations on time and collection of physical bricks. Digital entries also will have a variety of building skill in members with limitation on time and ability to use the software. If anyone has questions on how to do fancy stuff digitally, there are a lot of tutorials in the LEGO Digital Designer and other digital tools forum. I have a question about rule #10. What exactly does "stacking baseplates" mean? I don't have 16x16 of the baseplate of the colour I want, but I have 2 of 8x16 of that coloured baseplate. Does this mean I cannot participate to the contest if I connect those two in some way(with buildings, trees or simple plates), or does baseplate stacking mean something completely different? Also, does it necessarily be a ship/vessel, or can I make a scene where pirates go wild on a settlement as well? I have a question about rule #10. What exactly does "stacking baseplates" mean? This entry was on an 8x8 base. I might be able to enter the competition... But I am still not confident in my photographing skills. Also the only camera I own is a cellphone. I also don't have any picture editing program for my computer where I can remove the background, so my pictures will be very inferior to those of other members. Does anyone know if there is a good editing program legally available for free?